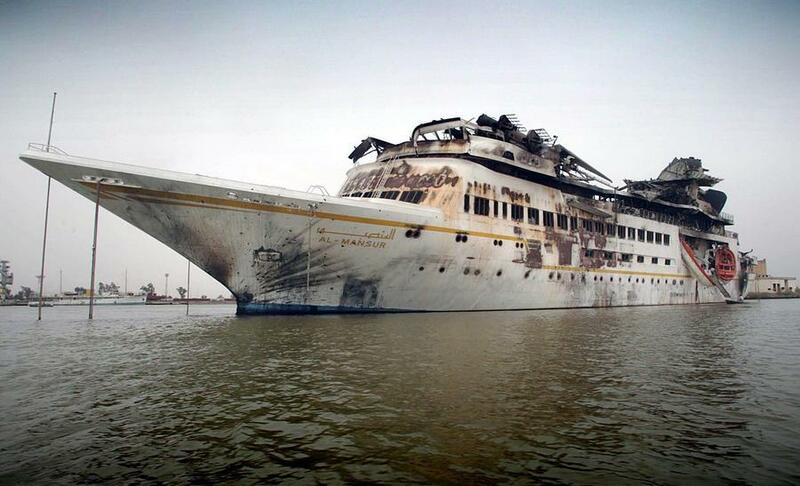 This was the state of Iraq dictator Saddam Hussein’s luxury gin palace, the Al Mansur (‘The Victor’) after it was bombed during the Iraq War in March 2003. United States F-14 Tomcats attacked the yacht, presumably targeted as a state asset and symbol of Hussein’s power. The vessel didn’t sink but the bombs did enough damage and it was later decommissioned (it would have taken more than a lick of paint to get it right again, to be fair). The 400ft boat, weighing 7,400 tons, could seat 200 guests under a glass atrium in the middle and even had a secret escape route descending down from Hussein’s room into a submarine launch pod.